Exploring LEGO® Mindstorms®: Tools and Techniques for Building and Programming Robots is the complete guide to getting the most out of LEGO Mindstorms EV3. Written for hobbyists, young builders and master builders alike, the book walks readers through the fundamentals of robot design, construction and programming using the Mindstorms apparatus and LEGO TECHNIC parts. 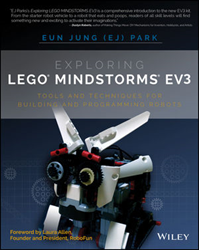 Written by Eun Jung (EJ) Park, a recognised authority in LEGO robotics curriculum, Exploring LEGO® Mindstorms® begins by covering the basics of the software and EV3 features, before letting readers get to work quickly by using projects of increasing complexity. It includes plenty of examples throughout every step. The book also shows readers how to build unique EV3 robots that each present different functions, including: the Spy Rabbit, a robot that can react to its surroundings; a Sea Turtle robot, Mr. Turto; and a Robotic Puppy Guapo. As well as helping users discover ideas and practices to develop their own method of designing and programming EV3 robots, Exploring LEGO® Mindstorms® provides extensive guidance - from the very basics of block programming through to data wiring – that will enable them to unlock their EV3 potential and ignite a lasting passion for innovation. Exploring LEGO® Mindstorms® is available in paperback and e-book priced at $34.99. Eun Jung (EJ) Park has been developing LEGO robotics curricula at RoboFun since 2010. There, she designs robots that are used in STEM (science, technology, engineering and math) programs for children and youths. She also designs and builds automatons, mechanical moving sculptures that respond to human interaction.